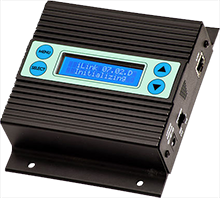 This remote load device is used for organizations that need messages updated four or more times per year, and would like the messages to be managed remotely. Audio is uploaded via a dedicated or shared telephone line. This state-of-the-art digital audio playback device is easily managed by plugging the USB flash drive into a computer’s USB port and “dragging and dropping” MP3 files from the computer to the drive. An enterprise class Message on Hold announcer. Features multiple audio output zones, advanced scheduling and internet-based loading.